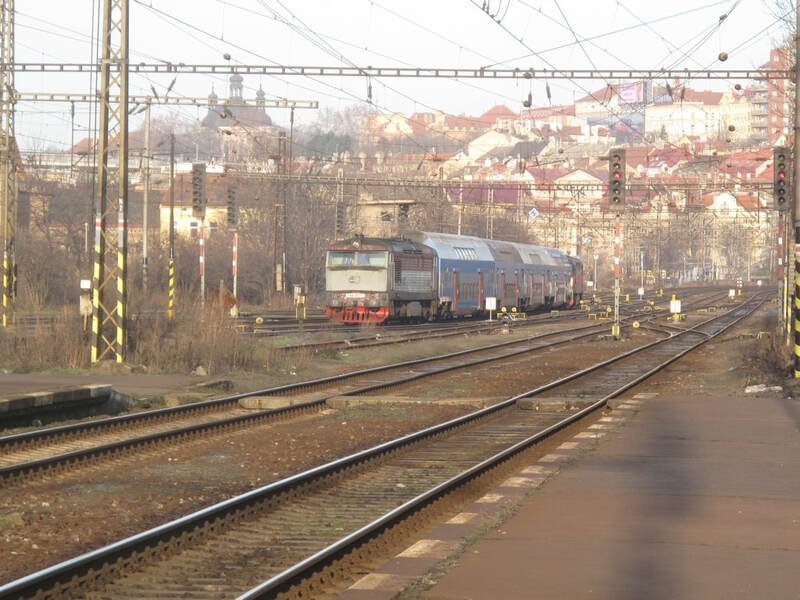 Surprised to find myself heading back to the Czech Republic so soon, but the routes offered by Desperate Railtours proved more appealing than another winter weekend in the UK! Away on a surprisingly sunny and pleasant morning after a week's 'anticyclonic gloom' accompanied by a stinking cold, now thankfully on the wane. A late running 10:52 ATW to New St started the trip. As I was on an Advance TFC-SSD I'd gone one train earlier than necessary so no problem. 12:10 BHM-EUS was an 11-coach Bendyleano with my reserved seat, requested as facing aisle, turning out to be back window. You can't win 'em all. Time got lost somehow or other but the 10 minutes late arrival wasn't a problem and a quick transfer on the Victoria Line got me to Tottenham Hale just in time for 14:07 Stansted Express. The net result was a 2 1/2 hr fester at Stansted but by the time I'd got some lunch, spent 25 minutes queueing for security, and had a pint of discounted Broadside at Spoon's, quite lot of it had gone. Easyjet's Airbus pushed back exactly on time at 17:15 but then had to wait for an incoming aircraft so didn't get airborne until 17:30-ish. Unfortunately for me the stag party I'd seen in the terminal at Stansted and was dreading, was in fact on the flight along with a number of other young persons of varying degrees of unruliness. I was glad to get to PRG a few minutes early, allowing me to scoot through the terminal, find out that the DPP office did NOT stay open until 21:00 as advertised, and still get the 20:24 bus with ease from a booked 20:15 arrival. A 90 minute ticket gave me time to visit hlavní nádraží on the way to I P Pavlova and collect a Central Bohemia rover for tomorrow. Hotel Green Garden was easily located 5 minutes or so from the Metro station and at the time of writing seems entirely suitable. Still only 21:45 when I got there, so hot footed it round to Pivovarský Dům for a couple of světlý ležáks and a plate of (horse?) stew and dumplings. Very satisfactory end to stage 1! After deciding last night to go for 08:12 instead of 09:12 from Na Knižeci I dithered almost to the point of missing it. Eventually staggered to breakfast which covered most requirements - full English, fresh fruit salad, cake plus all the usual. Thence to I P Pavlova for an interesting ticket buying experience in pidgin German, and on by Metro C and B to Anděl and Na Knížecí where 810 236 awaited. Up the Prague Semmering to Hostivice - no luck, as we ran into P3. I hoped the next Os to Mas might do P4 but no, straight into P5. I dived on anyway, hoping to swap over on to the Os going the other way at Ruzyně. This I managed to do but it too ran in to P3 at Hostivice. 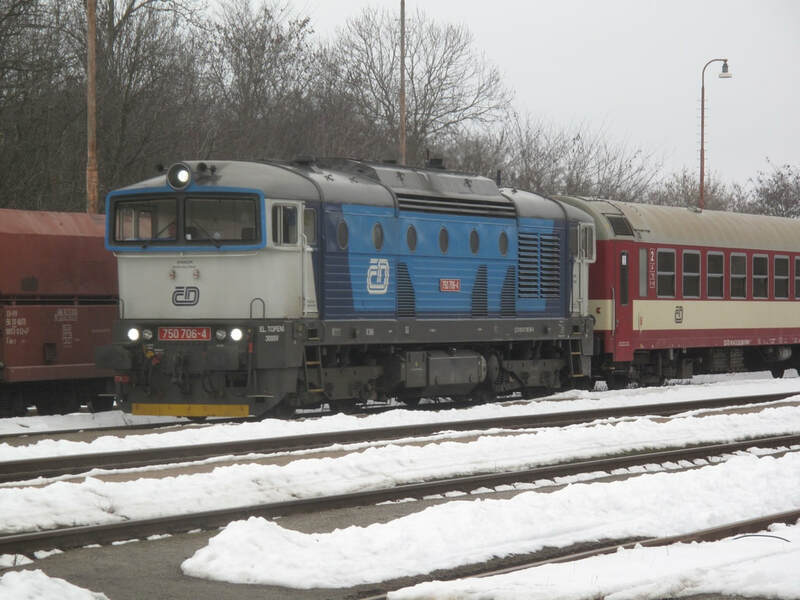 While waiting for the next attempt it finally dawned, with the help of the yellow sheet, that the alternating R and Sp services cross at Hostivice. I don't know why the penny never dropped before. Sure enough a Goggle turned up with the R and occupied P5, and the inbound Sp had to use P4. I dived on to that, and the 120/122 connection was done. Into Mas this time, to await the 10:25 City Heffalump to Milovice. This was to make sure of the physical connection at Lysá and do the newly electrified branch. Milovice looks a bit more lively now, with through trains to/from Praha Mas and a half hourly service. And a shop. Back to Lysá on the same Heffalump and on to Mas on another. They're a great improvement. On the way back to Mas I decided on a fill-in move to the brewpub at Beroun and just made the 12:20 Heffalump from hlavní to Beroun with the aid of a 26 tram. Surroundings were as dire, and the beer and the pub as good as I remembered. Only CZK20 for the světlé, too. Back to Praha on a wedged Alex ex München, fortunately with a handful of empty seats in a ČD coach at the rear. There seemed to be time to take in the new Victor brewpub so I baled out at Smíchov on to Metro B to Florenc, then the 133 bus to Tachovské Náměstí. The pub is a very unassuming one-roomer with an alarming spiral staircase down to rather Belgian 'facilities'. The brewing kit occupies one end of the bar. Beerwise very palatable (I had the cooking lager) but I couldn't honestly claim to distinguish it from several others. After a 'swift half' I made my way to hlavní via a 207 and Metro C. 15:59 Brno was as predictably wedged as you'd expect on a Friday and I was again lucky to get a seat, comfortable enough to sleep most of the way to Kolín. 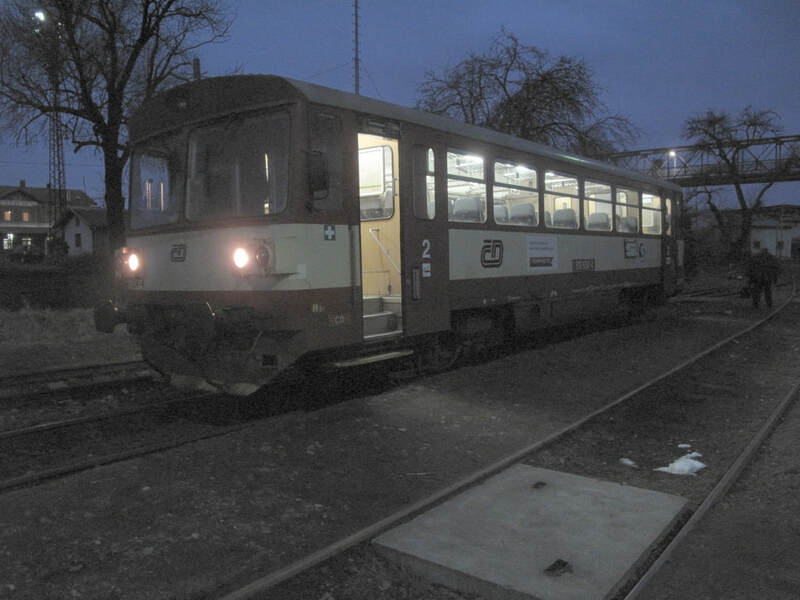 Horror on arrival at Kutná Hora to find no facilities to cushion nearly an hour's wait. Worse, there was no sign of the alleged through working to Třemošnice, and when the wheelie bin arrived there was indeed only one. I thought it worth a try though and went through to Čáslav where everyone baled out. I was about to give up then thought I'd ask the guard who first pointed me over the bridge then waved me and another British gricer back on to the 'bin. And so the Čáslav connection got done, and just about in daylight! [But my conscience got the better of me in the end and I went back to do it in proper daylight in June 2016]. 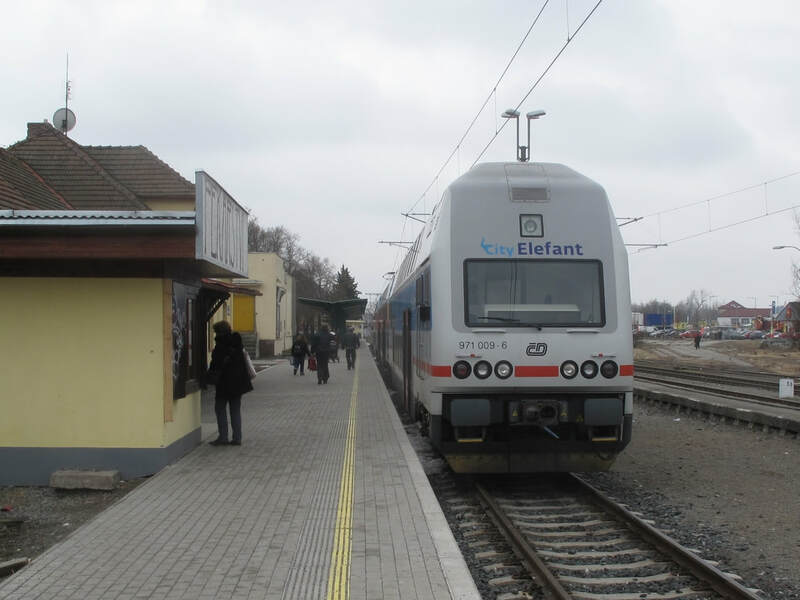 It then remained only to get the R back to Libeň at 18:50. I'd hoped for a beer beforehand but it was not to be. Čáslav was shut. Decamping at Libeň, I made my way to the Richter brewpub by trams 8 and 3, only to find the customary Friday night wedge, no seats available. By this time it was very cold and weariness was setting in so I settled for return to the hotel, with a quick refuelling stop en route. Unusual luxury of another hotel breakfast before departure via Metro C to hlavní for the Desperate tour. No indication of where it was but that was easily solved by trotting up to platform level and looking for Polish freight locos. It turned out the issued timings and the official ones were rather different but we left late by both anyway! Despite that, timekeeping was generally excellent. Route was hl.n., Vršovice, Malešice, Libeň, Mas avoider, Bubny rev., Mas avoider, Vysočany. Lysá,, Nymburk freight avoider, Velký Osek rev, Chlumec, Hradec Kralové avoider, Pardubice rev, HK avoider, Velký Osek, Nymburk freight avoider, Pořičany (west end connection), Bechovice, Malešice, Krč, Radotín rev, hlavní. Generally excellent day, concluded by food and beer at Bašta in a typically multinational group of US, Canadian, Czech and me. 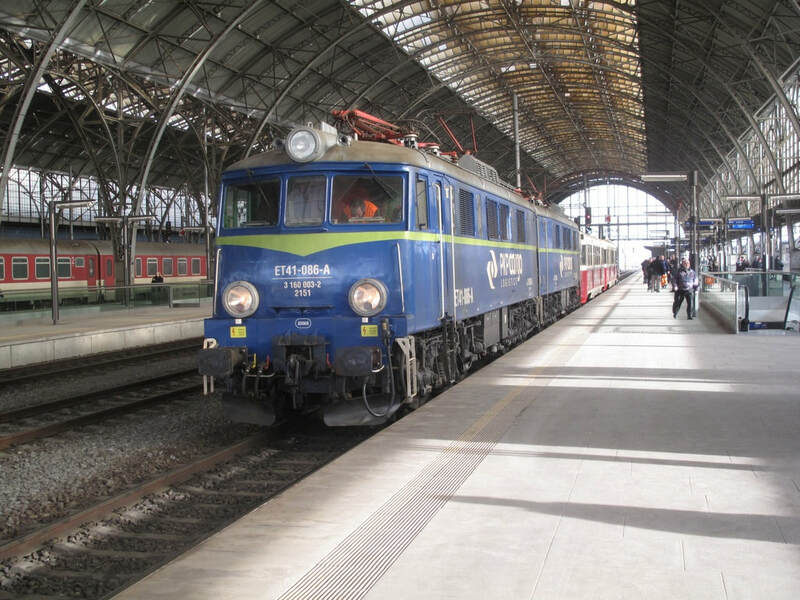 Double electric ET41-086 at Praha hl.n. with the tour train. At the other end is an immaculate T435 003. Well, it started OK. Shower and a speedy breakfast then off to Bruselská for 07:35 tram to Náměstí Bratří Synků, thence round the corner to Otakarova for a 24 to Vršovice. All good so far but then on to the train at 08:30, only to be told there was a container train blocking Žižkov and no certainty whether/when we could get in. There followed a prolonged farce while the organisers tried to work out a route with ČD. We went to Malešice, sat for a short while, then to Hostivař for a while. Returning to Malešice we reversed almost instantly, continuing by last night's route to Krč. Another instantaneous reversal there, then back via the passenger route to Vršovice. It was then decided to do yesterday's missed bit, via the avoider to Smíchov. At this point my patience with the entire world of railtours expired and I lost all interest in Žižkov goods. I baled out, watched the trains for a while then returned to the hotel. Before I'd had time to start sulking I realised that if I got up to I P Pavlova sharpish I'd be in line with my original post-tour plan. So I did just that and got 11:14 Metro C to Opatov, eventually realising after heading off into the wilds that the bus stops are directly above the Metro station. No harm done, and the 363 bus turned up on time to get me out of the cold and away to Průhonice. Here the excellent U Bezoušků brewpub [2018: sadly no longer brewing] provided arguably the best světlý I've had from a Czech micro. Nice grilled pork for an early lunch too, and they even supplied me with a T-shirt at reasonable cost. I returned on the 363 and completed Metro C to Háje. Here I just missed the bus connection so had 13 minutes to find the stop for the 125, most of which I needed! One stop on that then a short walk past a huge block of flats to find the improbably situated Jihoměstský Pivovar. Concrete blockhouse style outside, wood panelled, tiled floor beer hall inside, with a gallery. Good effort in the unlikely surroundings I thought (no more unlikely than the other Richter pub, I suppose). By way of a change I tried their 13° weissbier which left me a little underwhelmed. The světly ležák was more to my taste but still didn't really match up to U Bezoušků. Having got over Friday's grump at Richter I decided to go back to the original. So walked back to Háje (it's so close the bus is hardly worth it) and thence Metro C to Kobylisy and tram 3 back to Bulovka. Seats were available this time and the světly ležák in 'nefiltrova' form is a different and hugely better animal in my uninformed though experienced opinion! I really would question Richter's reservations policy. I go in at 16:00 on a Sunday and 6 of the 10 tables are reserved. Of those one is occupied by one person. Another four arrive later. Of the remaining four, a family are occupying one, and two people have another. I take the third. One or two more arrive, including two who are asked to share 'my' table which is no problem at all, and then with 11 of the 60 seats occupied, two polite and sober young blokes are turned away despite my efforts to point out that I was about to leave. If I continue to resent this sort of customer relations, I won't be back in a hurry. Back into town on the number 10, and for my final brewpub, U Dvou koček (Two Cats) near Můstek Metro. This seems to be Pilsner Urquell's (SAB Miller to you and me) attempt to emulate the München brewers' attempts to emulate brewpubs. The beer's good, staff are nice, Becherovka/Slivovitz hard sell is annoying albeit easily refused, and the non-optional squeezebox music is absolutely diabolical and inexcusable. Sum it up? In all fairness it's nicely presented and OK for a tourist spot. As a representative Czech pub? Er ... no. That seemed to round off the day, so back to the hotel via B and C, for a reasonably early night. Breakfast again, can hardly believe it. I left in good time fortunately, as road works delayed the 119 quite badly. By the time I'd got into the airport wi-fi the gate was assigned and once through the security checks I settled down to type my notes and the incoming aircraft arrived from Stansted – so hanging about bored didn’t really feature. The flight left a few minutes late but arrived early at 11:15; despite having to get the shuttle in from one of the ‘islands’ I was through immigration very quickly with the aid of my chipped passport and by 11:37 I was seated on the 11:45 Stansted Express. In to Tottenham Hale on that, then the Victoria line to Euston followed by a quick diversion by bus to the Metropolitan at Baker Street (Elgood’s Thin Ice, surprisingly nice) prior to the 14:23 Pendolino to Wolverhampton and the 16:45 Wolves-Shifnal where H kindly collected me.